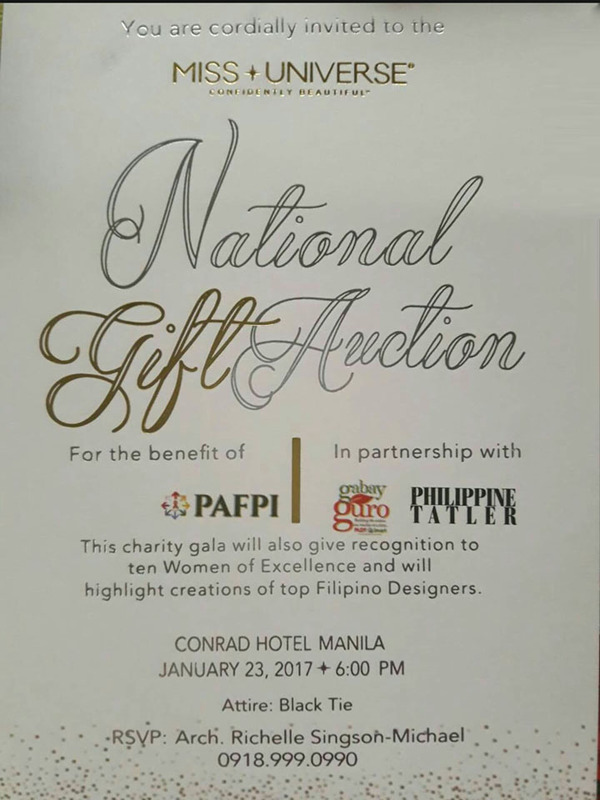 PAFPI was the only chosen HIV NGO in the Philippines to be the beneficiary of the National Gift Auction of the 65th Miss Universe competition. The Auction was held on January 23, 2017, at the Forbes Ballroom of the Conrad Hotel. Each of the 87 contenders for the title of Miss Universe donated a gift from their home countries. The gifts were put up for bids at the event. Ten items were put up for live auction in the ballroom, while the rest were auctioned by silent bidding. PAFPI was chosen through Pass it Forward, which is the official charity partner of the 65th Miss Universe competition. The auction was huge success. The amount raised will be a tremendous importance for PAFPI’s possibility to continue working to help persons living with HIV/AIDS and their families. Furthermore, the event itself was a milestone in the fight against stigma and discrimination. All of this was made possible by your choice of PAFPI as the beneficiary. For that, PAFPI’s board, our employees, our volunteers as well as the many recipients of PAFPI’s assistance are truly honoured and grateful.